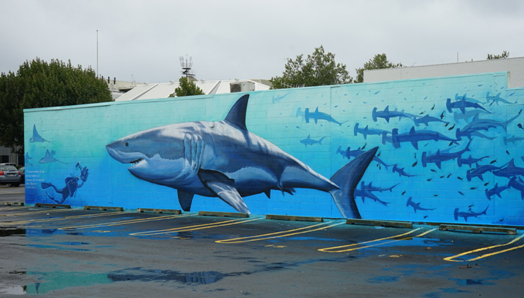 Ocean conservation foundation PangeaSeed has gathered 30 artists from around the world for Oceans Festival Sea Walls in the coastal city of Napier in New Zealand. 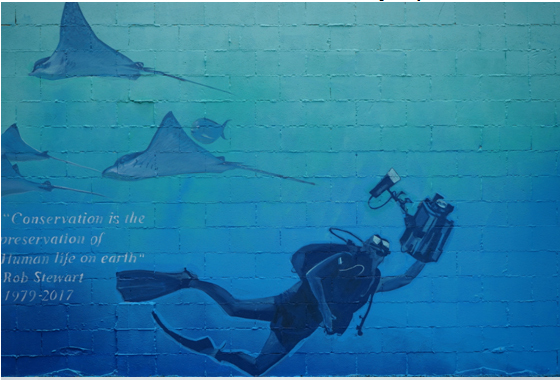 A mural depicting a diver filming sharks was designed and painted by New Zealand artist Freeman White as a tribute to late Sharkwater filmmaker Rob Stewart. The mural was painted in five days during the festival from March 20 to 25 and is Freeman’s largest mural to date at approximately 23 x 4 metres. What a breathtaking work of art. Really wonderful to see people all over the world paying tribute to Rob. I look forward to the next Sharkwater! What a thoughtful tribute, lovely work! Such a beautiful way to honour Rob’s life! too bad the quote is wrong!! the actual quote is Life on earth NOT human life on earth..
What a wonderful tribute to Rob. This is beautiful. Rest in peace Rob, your legacy lives in through all of us. Awesome tribute!! Very powerful art piece that sums up Rob’s passions. I especially love the Rays! Thank You! Gorgeous. Rob would have loved this, it’s amazing, I hope it stays there forever.